As a child I loved those Popsicles known as Push-ups, do you remember them? They were a cross between ice cream and a Popsicle, maybe like a sherbet, either way I loved them. I know they still make them today and I have had them recently but they just weren't as good as I remember them from when I was a child, maybe my taste buds have matured but one thing is for certain, I still love the idea of the push-up Popsicle so imagine my excitement when I saw these beauties from sprinkles cupcakes. I however wasn't excited by the idea of eating cupcakes in a new cleaver way, no I was excited by the packaging and the possibility to make my own push-up Popsicles in any flavor my "em-agination" can think up. I had to find where I could get my hands on these babies and find them I did. Once they arrived, off to work I went making my own push-ups and they didn't disappoint. The first flavor I made was a take on the Jello pudding pops that were everywhere when I grew, yet impossible to find today. So easy to make, yet so yummy. Here is how I made them. Mix the pudding into the milk, let set until it starts to thicken. Once slightly thickened, fold in 1 cup of whipped cream (that has been whipped to form peaks.) Spoon into the push-up molds and then spoon in the remaining whipped cream on top and sprinkle crushed Oreo cookies onto the whipped cream. Freeze until hard and enjoy. The second flavor I made was a raspberry cream push-up. Here is how to make these. Mix the jello into the water just like the box instructs, 1 cup hot water, 1 cup cold water, let set until the mixture cools, (not hardens, you still want it to be in a liquid form) and fold in 1 cup of whipped cream. Pour into the molds, top with the remaining 1/2 cup of whipped cream and top with a raspberry. I love how you can see the bands of color in this push-up, so pretty. I can't wait to come up with even more flavors, using different things like yogurt, juices, fresh berries etc. 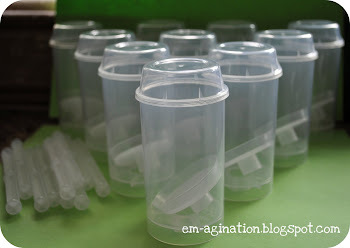 These containers are so cool and can be used again and again, just what we need on a hot summer day (when we get one) and a great activity to do with the kids, create your own Popsicles. We also poured straight juice into the molds just to see if they would leak and they didn't so a straight juice push-up Popsicle is also a possibility. As an added bonus, you can also make cake shooters too, just like you would find at Sprinkles Cupcakes. So you are asking, where do I get those cool molds, right??? Well I had a hard time finding them and when I did they were only sold in large quantities so I bought a large quantity. Do you want some without having to buy them in a large quantity, well today is your lucky day because I am going to give you a chance to win a set of 10 push-up molds. All you have to do is follow my blog (if you aren't already a follower) then come back here and leave a comment telling me you are a follower with a way to contact you if you win. I will close the give-away on Saturday April 23rd at 9 AM (pacific standard time) and post the winner here. Good luck!!! By the way if you are already a follower, just leave me a comment telling me you already follow and you will be entered to win. If you don't win, I will also be selling the extras I have for $1.00 a piece plus shipping, not sure what that will be but if you would like to buy some, send me an email or leave a comment with how many you would like to buy and I will figure our the shipping cost and get back to you. New follower from skip to my lou! You are so talented and creative and hope to win, too. My name is Blair Smith and my e-mail is BMS0009@tigermail.auburn.edu. My blog was a blog for school (so I don't really use it to write my own posts) but I've recently began crafting again and noticed this post on pinterest.com! I am a new follower and I would love a chance to win some of those push up molds, they would be perfect to make treats for the kids now that summer is almost here. What a fun idea! It reminds me of being a little kid! I'd love to win some of these! If I don't though, I may have to buy some! Too cute for words. Would love to win these!! I'm a new follower! How awesome! 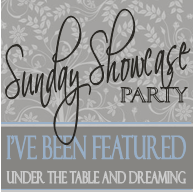 I found you through Sugar Bee Crafts and I'm so glad I did. I love this idea ~ I have so many ideas for popsicles and these push ups will be so much cuter than the little paper cups I was planning on using! What a "SWEET" idea! I came over to check out your animal pillows and saw these along the way. I'm following and HOPE I win. I LOVE those! I would LOVE to make some for my son.......I just recently bought him some push ups but I would love to make him some in a more healthier version! I am a new follower and I love this idea. I really hope I win them. my hubby would love to eat these. oops forgot to say that I am a follower and your ideas are fabulourifically cute! Love them! I've been eying up those push-up containers for a while now and haven't taken the plunge yet because I don't need SO many :)Love what you did with them! Oh and I'm a follower! We have popsicle molds, but push up ones would be so fun too. I'm a new follower. Such a great idea! I saw these and wanted to buy but had no idea what I would do with the SUPER large amount they sold. So glad you are willing to share! I'm a follower on GCF. :) These look so great! New follower! I would love to win but if not I WANT, no I NEED to buy some. Please email me kaceejburke@gmail.com Thank you! SUCH a great idea!! So cute and you made them look so lovely...Ill take 2 chocolate please!! This would be perfect for my Foodie Friday linky party - stop by this week and link up! Once again, these are a really super idea. Puts the fun into being an adult!! 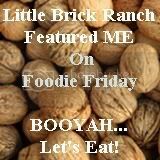 Thanks for linking up to Foodie Friday! Love the idea of making your own push pops! Genius! This is great! I've seen the cupcakes but not pudding before1 We'll have to do this! When you say "large quantity" what do you mean? I have been trying to hunt down a vendor to get these in large quantities, but the largest I find is 100... and I am seeking more than 100 at a time.